As if to make a mockery of the so called autonomy of the recent award of Native Title to his people, Kevin Buzzacott (pictured) had to get a permit from the police to drive down on a public road from his home to the north here to join the protestors yesterday. So end of daylight going into music and dance celebration tonight and all is good. Very friendly feeling amongst everyone as people get to know their neighbors in pitched tents next to them. People chatting around camp fires, reviewing their part and impressions of today’s great march to the mine entrance gates where people dressed in very colorful outfits and hairstyles Bollywood and danced their booties off. Some amazing break dancing on the road to a very appreciative audience. The cops who were thick in presence looked on stoney faced from behind the BHP wire and off to the sides. The cost to the taxpayer for this over policed event must be phenomenal. But we love the Land. We love the country. We know why we are here to protect country and the Future. As Uncle Kevin said at utoday’s press conference, “one bulldozer and 40,000 years is gone”. Capturing carbon, unlocking wealth for Aborigines BY: MARK SCHLIEBS AND PATRICIA KARVELAS The Australian July 13, 2012 JOHN Kite is at the helm of a newly acquired, neglected cattle station in South Australia’s outback that could soon become one of the first indigenous-owned carbon farming projects in the country. Police block mine road to protesters, BY: MARK SCHLIEBS The Australian July 12, 2012 POLICE will set up roadblocks around BHP Billiton’s Olympic Dam mine in outback South Australia, creating further anger and warnings of confrontations with anti-uranium activists who plan to “shut down” mining operations during a five-day protest at the site. Two roads leading to the Roxby Downs mine, in the state’s remote centre, have been blocked ahead of the first day of the protest on Saturday. The road protesters planned to use has been blocked 4km from the mine’s southern gates. Only mine workers, emergency services workers and people individually approved by police can use the roads. Protest organisers had hoped between 200 and 2000 activists would attend the demonstration and a music festival. One organiser, Nectaria Calan, said yesterday the police were being deliberately antagonistic. “They’re blocking a public road,” she said. “On the one hand, they’re saying we’ve got the right to protest but on the other hand they’ve already made moves to prevent us from doing so.” She said the activists would decide how the protest would proceed once they reached Roxby Downs, but would not rule out blockading the roads. Further curbing the appetite for refined copper, BHP now sees recycled scrap meeting up to 50 percent of China’s overall demand in the coming year for the metal, up from 35 percent now. BHP Olympic Dam delay would tighten copper supply Reuters, By James Regan SYDNEY | Fri Jul 6, 2012 “….. A 25 percent drop in benchmark international copper prices since early 2011 has eroded potential returns from the project, and the economic slowdown in top base metal consumer China has dampened the demand outlook. project in Australia be delayed. The sustained drop in copper prices has affected the potential for returns on the project, and China’s cooling economy has added on to demand woes. BHP intended to expand the mine in order to increase output fourfold from what is the world’s fourth-largest known copper deposit and biggest source of uranium. 40 percent of the world’s copper demand comes from China, which also cut its interest rates last Thursday for the second time as it increasingly focuses on shoring up its economy. BHP is working on turning the Olympic Dam, which is currently a mine, into an open pit operation. The board will make a decision by year-end on whether or not to continue the process, which would produce 750,000 metric tons of copper and 19,000 metric tons of uranium a year. Right now the biggest problem is figuring out whether the current levels of copper will mean an oversupply as demand slows down everywhere…. for now, the analysts advise against the sort of mining expansion BHP is planning. Reuters reports: “Now is not exactly the right time to be thinking of bringing more copper into the market and BHP knows this,” said Gavin Wendt, a mining analyst with MineLife in Sydney. we should also try to engage genuinely with the important moral issues that the protestors are highlighting. Their agenda is quite public , which is more than could be said for the private sector interests they are protesting. We might also question why the police are deploying over 200 personnel to “manage” a peaceful protest and what violence police have instigated during similar events in the recent past. Peaceful dissent and a lizard’s revenge http://www.abc.net.au/environment/articles/2012/07/10/3541989.htm PETER D. BURDON ABC 10 JUL 2012 Protesters at the Beverley uranium mine were treated in a “degrading, humiliating and frightening” manner in 2000, according to a later judgement. THE ANTI-NUCLEAR MOVEMENT in Australia can be characterised by several key themes – colour, lentils, solidarity and a commitment to nonviolent acts of resistance. Another pervasive theme that characterises the past forty years of activism is power imbalance. On one side of the struggle you have poor and sometimes dislocated indigenous people, students and concerned community members (greenies). On the other side there are billion dollar companies, the Government, State police and the media. Such is this power imbalance that many campaigners will spend decades resisting without reward. Those who are fortunate to be involved in a campaign victory (or even a slight concession) have also seen promises betrayed and decisions reversed. Jim Green: Project a rule unto itself Adelaide Now, Jim Green July 10, 2012 OLYMPIC Dam is like a state with no environment, water, Aboriginal and FoI laws, says Jim Green. HUNDREDS of Australians will converge on BHP Billiton’s Olympic Dam uranium/copper mine – and a camp up the Oodnadatta Track – from Saturday for five days of protest, education and entertainment. The concerns leading people to participate are many and varied. The overarching concern might be expressed as a failure of governance – corporate and political. Olympic Dam is a state within a state. It operates under a unique set of laws enshrined in the amended Roxby Downs Indenture Act. That would be unobjectionable except that the Indenture Act allows Olympic Dam wide-ranging exemptions from environmental, water management and Aboriginal Heritage laws and, for good measure, it curtails the application of the Freedom of Information Act. 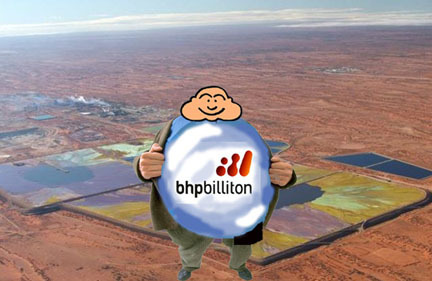 BHP Billiton’s open cut Olympic Dam copper/uranium project to be shelved indefinitely? BHP (NYSE:BHP) Reports It Will Make Tighter Worldwide Copper Supply- USA Election News, 9 July 12 By: Jessica Honsinger BHP Billiton Limited (NYSE:BHP) reported on Friday that it will make tighter worldwide copper supply from late 2013 onward if it delays work on its single-biggest project, the $30 billion growth of the Olympic Dam mine in Australia. Protesters vow to shut down Olympic Dam, Police reporter Doug Robertson The Advertiser July 07, 2012 HUNDREDS of police will be sent to Roxby Downs as thousands of protesters from around the country attempt to shut down the Olympic Dam uranium mine. The Desert Liberation Front website has issued an open invitation to more than 10,000 people to attend the six-day protest, music and art festival to be held on the outskirts of the town from next Saturday. It says it will take their protest to “Roxby Downs – gates of hell” to help “shut down the mine”….. More than 1200 protesters have already indicated they will attend while 723 others are seeking transport. BHP has shown similar contempt for taking responsibility for the impacts of its actions in Australia. The recently amended Indenture Act which will apply to the new mine continues to exempt BHP from the Aboriginal Heritage Act 1988, which applies elsewhere in the state. It is clearly a conflict of interest to have a corporation with a commercial interest in a piece of land also making decisions as to whether this same piece of land has competing non-commercial values. Uncle Kevin Buzzacott is an Arabunna elder. Arabunna land lies North of the mine site. The borefields which extract water for the mine from the Great Artesian Basin are located on Arabunna land. The recent recognition of the Arabunna peoples long standing Native Title claim does not give the Arabunna people any rights to contest the location of the borefields. The GAB feeds the mound springs scattered throughout the Lake Eyre region. The springs are integral to the desert ecosystem and sacred to the Arabunna people. They have already been impacted by the water usage of the current mine. Go-ahead given for huge wind farm http://www.adelaidenow.com.au/go-ahead-given-for-huge-wind-farm/story-e6frea6u-1226418325533 5 July 12, FINAL State Government approval has been given for the construction of a $900 million, 105-turbine wind farm in the state’s mid-north. The 315 megawatt Hornsdale wind farm, to be built 15km from Jamestown, would be the state’s largest, with the capacity togenerate 1,050,000 megawatt hours of electricity a year. The Development Assessment Commission gave provisional approval to the development in May, with Planning Minister John Rau yesterday giving developer Investec Bank Australia the green light to begin the development. Energy Minister Tom Koutsantonis said the project would create up to 250 construction jobs locally. Wind farm mooted near Barossa http://www.abc.net.au/news/2012-06-29/wind-farm-mooted-near-barossa/4100638 June 29, 2012 Pacific Hydro has submitted an application to the Development Assessment Commission for a 42-turbine wind farm on the edge of the Barossa Valley. The Keyneton wind farm would be north-west of Cambrai, with turbines running along about 15 kilometres of the eastern Mount Lofty Ranges. The company initially proposed 57 turbines for the area but reduced the number in response to community concerns about the visual amenity and potential noise. The nearest house to the wind farm would be about 1.7 kilometres away, with most homes between three and five kilometres from the project. The wind farm would power about 68,000 homes a year. Pacific Hydro already runs the Clements Gap wind farm, south of Port Pirie, and is proposing another near Georgetown in the mid-north. BHP buys more Olympic Dam licences Jun 27 2012 http://news.ninemsn.com.au/article.aspx?id=8490254 BHP Billiton has bought four exploration licences for areas in the Olympic Dam region in South Australia for $3 million. BHP bought the licences, and five exploration licence applications, from mineral exploration company Copper Range, which had been reviewing its presence in the Olympic Dam region since the departure of a joint venture partner. BHP is currently considering a massive expansion of its copper, gold and uranium mining operations at Olympic Dam. leave the uranium and all other radioactive waste at the mine site. Repeal the Roxby Downs (Indenture Ratification) Act 1982 and the 2011 amendments to the Indenture to: remove the extraordinary legal privileges granted to BHP Billiton including the override of state legislation that would apply to any other mining venture or commercial activity. and commit to biodiversity projects that genuinely compensate for the loss of flora and fauna caused by the mine project, proposed new open pit and associated operations. Protect the unique ecology of the Upper Spencer Gulf and the breeding ground of the Giant Australian Cuttlefish by: prohibiting the construction of a major desalination plant in this fragile region by BHP Billiton. These Recommendations are based on my recent update of the relevant sections of the “2010 State Election Agenda for SA” (authored by CCSA, ACF, TWS and NCSSA) that I had a lead role in as then ACF national nuclear free campaigner.